The word Friday is derived from Latin, meaning “the day of Venus.” Astrologically Venus is the planet of love and represents harmony and pleasure. In religious connotations, Eve is seen as the mother of all. She is the one who brings forth life. As the thoughts and ideas of women, come forth in the safety and presence of others, we all become more alive. This makes us happy and assists the whole because it lets the feminine nature rise and expresses itself more fully in the world. Discussion groups have long sparked our imaginations. As we find epiphanies within our life journeys, it is good for us to share them. They can then inspire others. 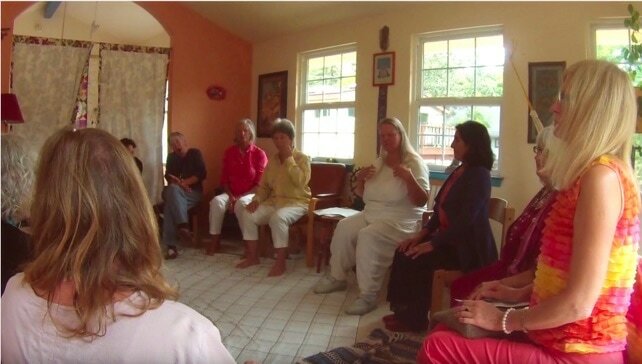 Within the circle of Eve’s First Friday, a new topic is shared each month by one of the women members. She brings to the table whatever it is that is causing her to feel more passionate, thrilled with life, enlivened and awake. As new ideas to come forth into the mind of our collective consciousness they incubate, merge and evolve. This results in new revelations and the deeper recognition of our collective human truth. This interior expression of the yin principle is what helps us all to grow. Eve’s First Friday consists of over thirty members, mostly women, empowering and supporting each other. It is a constant source of new perceptions and broader understanding. If you live on the Central Coast of California and would be interested in joining this group, please call (805) 549-8125. Men are welcome to attend.